Campsite Le Grand Lac is a campsite with 147 touring pitches and 23 year round pitches. 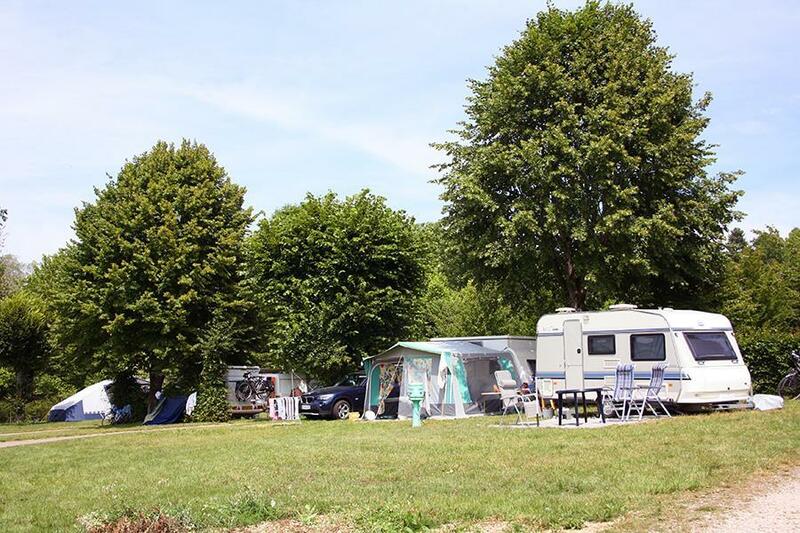 During low season, between 18-05-2019 - 05-07-2019 and 23-08-2019 - 22-09-2019, the nightly rate is €14,- at one of the 147 touring pitches at Campsite Le Grand Lac in Clairvaux-les-Lacs (Jura). At this campsite you can not only use your CampingCard ACSI for inexpensive camping, you can also use your ACSI Club ID (as an alternative ID). A quiet family campsite with direct access to the lake and the public beach (patrolled in high season). Within walking distance of the centre. Gently sloping grounds with mostly shaded pitches. The grounds are fenced and access to the beach is via a gate with an entry code (safe for small children). There is a pool on the campsite. A zero for us with two small dogs that are not allowed around the lake even on a lead. So Access from the campsite serves no use. Campsite in need of general amenities improvement and some renovation, but the price is low. Urinal right next to washing machine was a novelty! Reception overfriendly and as it did not open till 16h30 on a hot day, there soon was a long queue. Maybe ok for overnight stop but we won\'t return otherwise. Nice campsite next to a lovely lake and within walking distance of the town. Virtually all the pitches have a considerable slope, no problem for caravans but difficult for tents. Swimming in the lake is very nice, the pool was not open during our visit (mid June). Very helpful young lady at reception. Due to heavy rain the grass had not been cut which meant wet shoes and feet (it had been gut on the sister site next door). Can't see us going back, unless we get a caravan. Would you like to book Campsite Le Grand Lac or request more information? You can do both using the information below or by visiting the campsite's website. Enter Clairvaux-les-Lacs via the D678. Follow the D118 then the campsite signs. CampingCard ACSI will send your information request to "Campsite Le Grand Lac".